The essence of conversational marketing is of course to get people talking. To ignite conversation around a given service or product. To seed the conversation and amplify it, you need the right people to say right things about your product. For example you want the camera buff to evangelize your new digital camera to his friends for he is a trusted source of information regarding cameras. At least within his network. 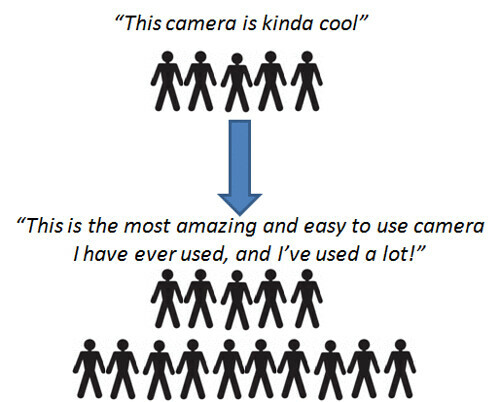 However, how do you get the camera buff to crank up the volume of your message, to amplify it. The key is in managing the expectation gap. To explain this concept I will use 4 scenarios at a local pizza shop. 1. You are hungry so you walk into a pizza shop you’ve never been to before. You are expecting a decent slice of pizza, but you’re primarily just trying to get a quick fix. The expectations are relatively low, but the pizza isn’t bad in fact it is slightly better than anticipated. You go back to the office and might mention it. The expectation gap was too small to register. 2. Now this time you walk into the same pizza place and are BLOWN away by the flavor. When you get to the office this time you tell everybody about this transcendental pizza experience. The expectation gap was huge, therefore the quality and volume of amplification is equally exaggerated. 3. Now if you get a slightly subpar pizza it’s also not a talking point as the expectation gap was insignificant. 4. The final scenario is if your best friend, whose pizza taste you agree with, raves about a particular pizza joint and you decide to give it a shot. However, the pizza was so bad you ended up throwing it away. 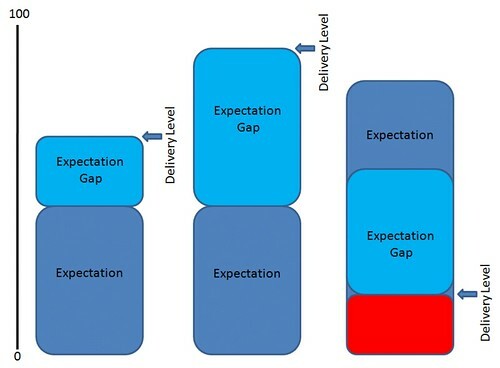 Due to the hype, the expectations were astronomical and subsequently the negative expectation gap was equally as large. You now go back to your friend and curse him out for making you endure such a terrible gastronomic experience, and vow to never heed another recommendation from him. In addition, you tell everyone else you know how bad it was. Finally, your friend, the evangelist, loses confidence in his recommendation and stops promoting the shop. The repercussions are severe. 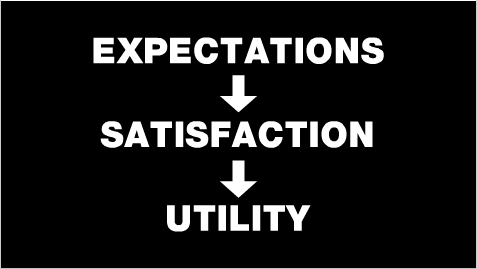 The greater the expectation gap, the more conversation, good or bad, is catalyzed around the product. The key to conversational marketing is optimizing the expectation gap, not simply hyping a product to unrealistic levels. In today’s world if the product under delivers word travels fast. As marketers we need to find the balance between building positive buzz around our products and not over-hyping. Create as great a gap as possible between expectations and delivery to catalyze conversation.